* The screen above is only an image (conditions may vary with setup parameters). 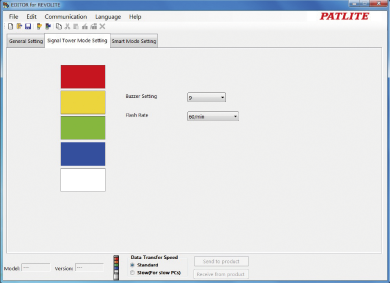 Select the colors from the provided color palette. With a maximum of 15 groups*, 63 series of operations can be registered to perform an operation setup as one group. * A single display type can register a maximum of 31 groups. Operation setup is easy. 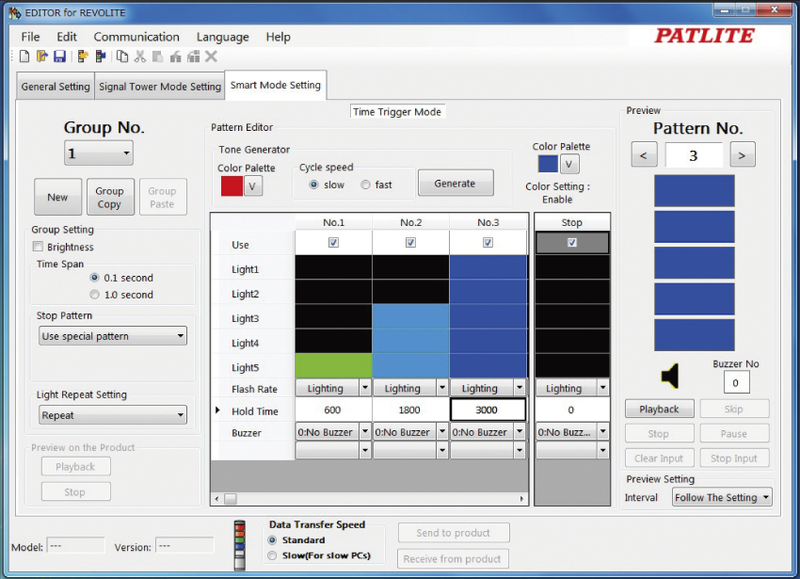 Select the desired color (21 colors), flashing period (if any), and length of time the light and alarm are on* (maximum of 3,600 seconds, (11 sounds). * Limited to Time Trigger and Pulse Trigger. Preview the light pattern before transmitting data into the unit. Data can be written into the unit and also read from it,so that patterns can be easily copied into other units. * Data transfer is also possible when the main unit is OFF and the system's power source is the USB bus power. Setups for "individual group" operation can be executed. Pattern change timing can be setup with the editing software. Transitions from one pattern to another can be triggered by setting elapsed time or by individual discrete inputs. The product memory operates for "individual group" functions. The color for each tier can easily be changed, even when used as a Signal Tower.